to join the Florida Venture Forum’s annual Friends of the Forum Membership Community, a listing of individuals and companies from the entrepreneurial and investor community who support the Forum and are active in Florida’s economic growth and development. As part of our continued efforts to extend our outreach statewide and throughout the southeastern U.S., we must develop an effective entrepreneurial network to assist with sourcing and identification of high growth companies. Your involvement is a key part of the development of this network. Whether you're looking to grow your social network or showcase your company there's a membership level that's right for you. Membership levels range from Silver to Corporate and feature a variety of Exclusive Benefits. To be included in this valuable resource, please complete the online Membership Application. 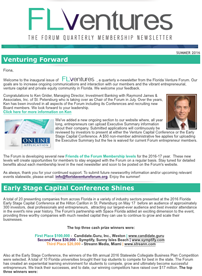 Thank you for your continued support of the Florida Venture Forum! New Membership Levels: Click on each Level to view the many Benefits! Discounted registration for both Florida Venture Forum and Partner Events. Company listing, logo and description in the Friends of the Forum Membership site. List your organization’s events on the Forum’s online calendar. Join us for the 28th Annual Florida Venture Capital Conference at the Vinoy Renaissance Resort in St. Petersburg, Florida...January 31 - February 1, 2019 (invitation-only VC/Investor events: January 30, 2019). The 2019 Florida Venture Capital Conference offers numerous networking opportunities, programming featuring top investors and deal makers, and Florida's most innovative and fast growing later stage, private companies. Past Presenters have raised approximately $3 Billion in equity capital. ~500 people attended the 2018 conference, including a conference record 200+ equity investors from across the U.S., Europe and Latin America, representing billions of dollars in deployable capital.